Jenny & Bubba’s Birthday Bash Party! 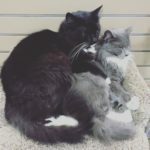 You are invited to Olsen’s Dewey Location to help us celebrate Dewey’s favorite felines turning two years old. 1:00 pm. – 4:00 pm. These two cats have become part of the Olsen’s family, and we look forward to their birthday celebration. Stop by for cake, ice cream, party games and a photo opportunity with Jenny and Bubba. This entry was posted on Wednesday, January 30th, 2019 at 2:36 am	and is filed under Events, News & Updates, Uncategorized. You can follow any responses to this entry through the RSS 2.0 feed. Both comments and pings are currently closed.